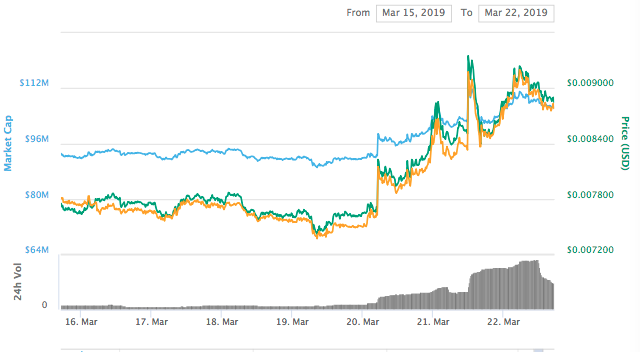 Even though there was a bloody Thursday involved, with the slow but steady gains of the last 24 hours it seems as if the week that closes saw another chapter of the reinstatement of the alt season. What are the best-performing tokens in the top 100 over the last 7 days? Even though Cardano has not been the crypto with the highest growth in so far, it gets to be mentioned first as it is the only one with a total market capitalization in excess of $1 billion. A possible influence for this sharp growth, which is mostly packed in the last two days, could be the apparently succesful release of a new mainnet version for the project. 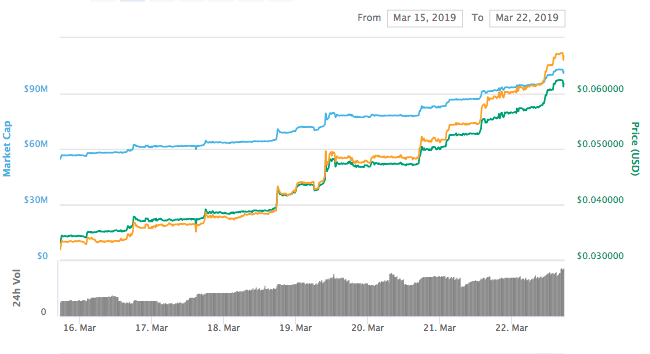 Maximine Coin has championed growth over the last week, almost doubling its price in just 7 days with an increase of 84%. Maximine bases its project in a cloud based pool mining platform and has been listed on CoinBene for a while now, although there is a surprising lack of fundamental announcements with price-moving qualities over the last week. The growth pattern of this project is extremely steep, having just joined the $100 million club today, coming from lows around $7 million on mid February, making it virtually unknown for most of the space. Tezos has performed similarly well as to Maximine Coin, with an increase in price of over 70% in only 7 days. Just like MXM with regards to the $100 million club, Tezos has done the same but with the $500 million one, reaching for a price range where it had not been seen since late November in 2018. The most relevant news from Tezos during the last week have been its completion of a first round of community voting, a step towards further decentralization in the project. Ravencoin is also on its way for doubling its price if it keeps on the same trend for a few more trading sessions, as it started the week with a market cap of around $85 million and is closing it slightly above $140 million, with its price spiking up from about $0.028 to $0.046 at writing time, for a weekly gain of 67%. Much like other projects, Ravencoin's gains have been tightly packed in a few days. There is also an apparent lack of announcements triggering this bull run. The exchange-based token, and native crypto of the Kucoin exchange giving users the chance to earn 50% of the trading fees revenue earned by the firm, has had quite an excellent week as well. Currently ranking on 59th position for market capitalization, it still has quite some distance until reaching the Binance Token (BNB), perhaps its most obvious competitor. However, the Huobi Token, which is also a bit lower on this list of best performing altcoins for this week, sits only 9 places above on the same classification. 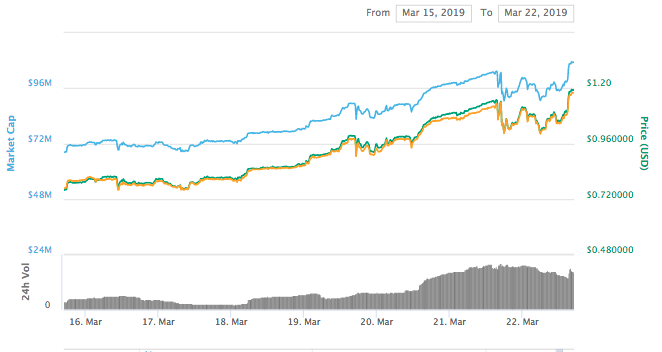 Over the past 7 days, its market cap has increased sharply all the way from about $72 million to more than $110, where it sits now after rising by 55% in the last week. 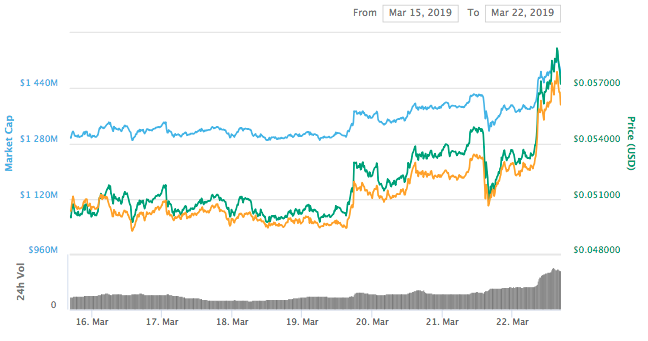 Although the rumour is a bit older, the comments regarding the possible launch of an Initial Exchange Offering (IEO) service could very well be partially supporting the rise. During the last week, Ontology has kept up with its bullish tendence. 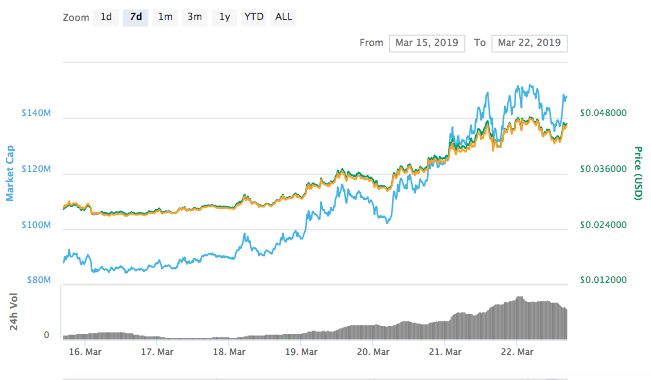 It has been following it for the past 4 weeks, since mid February, and its market cap has climbed accordingly from $185 million to over $600 in the same period of time. 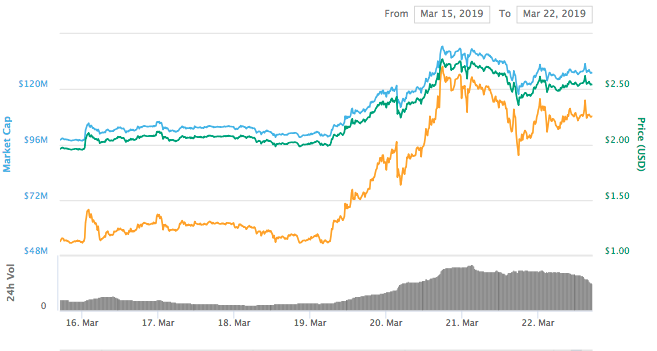 The last 7 days have seen a rise of more than 30% for Ontology, which is currently priced at $1.32. The token could have benefited from its listing of trading pairs in Bittrex at the middle of the past week, as Chepicap reported. Much like the Binance Coin (BNB) or the KuCoin Shares (KCS), the Huobi token caters to users of the exchange that has it as native currency. It can be used for several perks such as voting on exchange decisions such as listings, gaining early access to events, or purchasing monthly VIP status that come with transaction fee discounts. Perhaps following the steps of the KCS and BNB bullish patterns, HT has increased in 29% this week. The triplet could very well give room for interpretations calling for an exchange-based token season. The rise of the Huobi token is quite coincidental in time with the announcement of the launch date for the Huobi Prime platform, which has been called by the exchange "a brand new blockchain project evaluation model SMART-Chain 2.0", which will "review and select the best digital assets to be listed on our exchange based on such model". 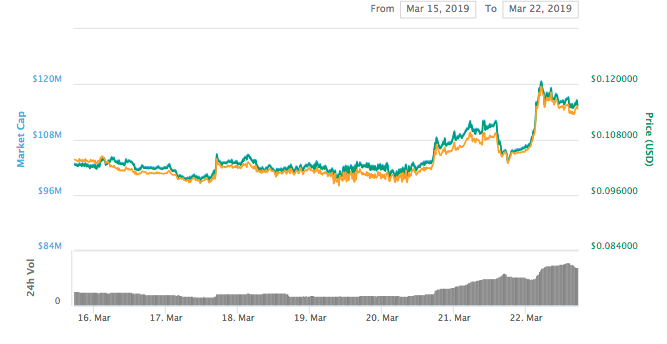 The gains on this section start to be rather modest, with IOST packing a decent 15% over the past 7 days. 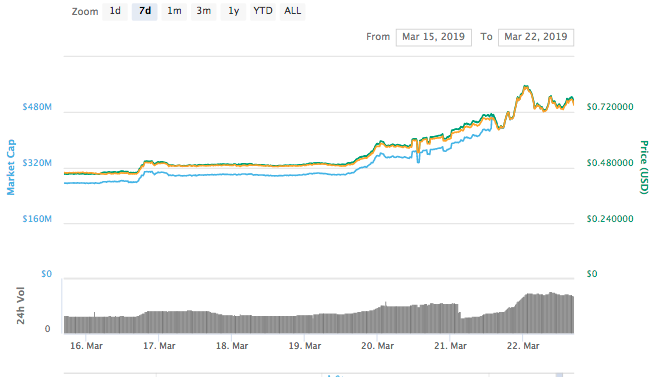 As seen in the graph below, most of the gains were achieved between the 20th of March and today, with the market cap of the project rising from the range of $95 million to peaks above $110 million. What could have caused the increase in IOST price? The answer here appears quite easy: yesterday, Binance launched the IOST trading competition, which will last until the 28th of March and will reward those users with the highest IOST trading volume. 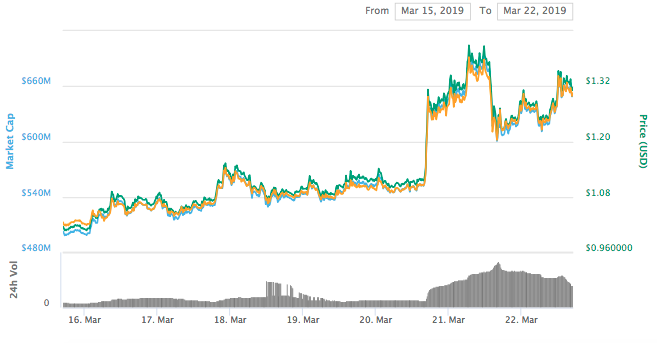 Much like IOST, Bytom had a great performance this week, mostly packed around the last days for a 13% gain. A rather modest achievement, also shared with Ethereum Classic and other tokens, is its inclussion into Bakkt's parent company ICE data feed. Is Altcoin season upon us?